In basketball this weekend, the varsity boys' team, ranked #10 in the state, posted a 48-37 victory over #3 ranked St. Anthony's High School on Sunday night in the 17th annual Scholastic Play-By-Play Tournament at home. The victory gives the Knights three straight wins and 16 of their last 17 games. The team is currently 22-3. Strong defense and timely scoring led the Knights to the lead throughout the game—leading 18-12 at halftime. Junior Alex Schachne scored team high 15 points with six rebounds. Sophomore Paul Mulcahy put up 14 points with seven rebounds. On Saturday, the Knights took on Immaculata in the semifinals of the Somerset County Tournament and came away with a 77-39 victory. Junior T.J. Chaney hit four three-pointers to lead the way with 16 points. Mulcahy chipped in with 13 points and eight rebounds. Freshman William Soucie had a career-high 10 points in the win. 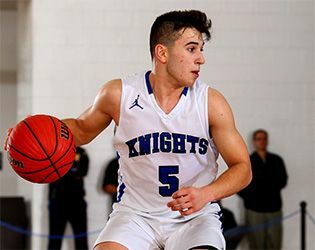 The Knights will next play at Franklin High School on Saturday, February 25, at 3:00 p.m. against Rutgers Prep in the finals of the Somerset County Championship.